It happens every year. No, not just the reunion, but the fact that The Mister invariably forgets to request off from work the day before the reunion, and we end up having to leave just hours after he comes off of his shift and the poor guy ends up awake for 24 hours straight. It happened again this year, and I drove a baby who had a very bad week and one very tired man out to the annual old-fashioned-farm-machinery-threshing-event that also serves as the backdrop for our extended familial gathering. The other thing that happens every year is we are nearly always blessed with the sunniest and mildest of August days, bluest skies, and big puffs of flat bottomed white clouds that set off the scenery just so. Tall stalks of corn and light green tobacco leaves waved in a gentle breeze. White farm houses stood stark against a patchwork of hills. This is Lancaster county. The traffic crawled along the two lane pikes, slower than a snail carrying a full luggage rack on its back. Tourist traffic and the increasing population compete for access on tiny roads that never kept up with the demands, making you run later and later. This is Lancaster, too. I say it every year, and sometimes we actually do it. "We need to stay over the night before." It's the only way to get an early start. My head spins. Children from previous years are no longer children, and are instead a foot taller, confident, with big kid mannerisms. My eyes see photo opportunities everywhere, and my hands fumble for my camera, but I'm so busy indulging in adult conversation and looking for familiar faces. Amazingly, our Duckling is not just having a good day, but a great one. There are sandwiches, and fruit cups, homemade root beer, and ice cream in four familiar flavors; Chocolate, vanilla, strawberry, and black raspberry. This year there were roasted peanuts, too. A few years ago, we brought two of our dogs. While sitting on a bench holding our pups by the leashes, an old man approached. He reached out a shaky hand towards our friendliest canine, a white fluffy dog named Buddy. The old man's face was alive with pleasure, his sunken mouth open in a wide smile. "May I pet your dog? I love dogs!" His proclamation came in a shaky voice, and he let out an ecstatic chuckle as his hand softly met Buddy's head. A fluffy tail wagged. Our more timid dog hung back. Buddy and the old man were having a moment of joy. It was a moment I could have lived a thousand times over and never got tired of living it. Seeing someone find joy and healing through interaction with a dog still brings me an enormous blessing. It happened again this year. 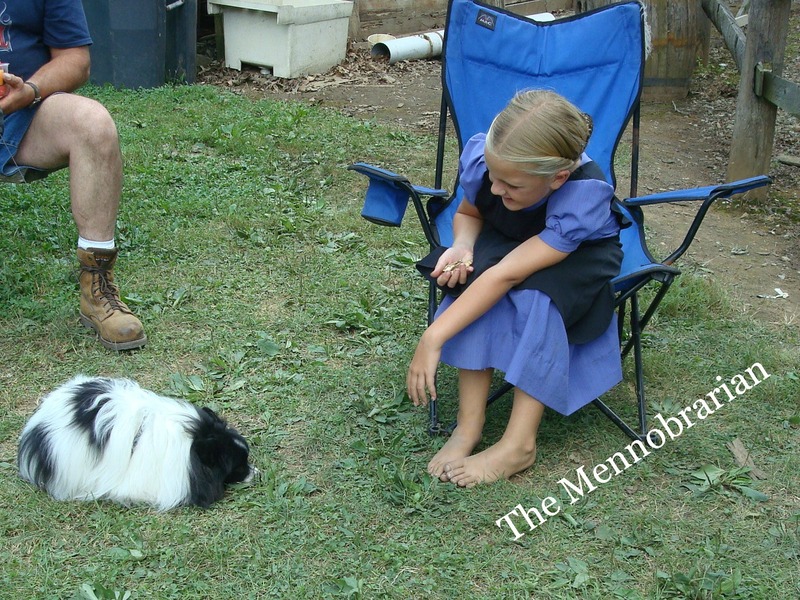 Lydia, solemn and barefoot, became alive at the sight of a small friendly dog. She tried to feed him a crumb off the ground, but this dog was a pampered pooch and would have none of it. When the dog would look slightly interested she would leap out of her chair, hungry for the interaction of an animal who loves for the sake of loving. Lydia was having a good time, but it was me who was having a reunion with a moment I never forgot. Reunions sometimes happen in the most unexpected ways. 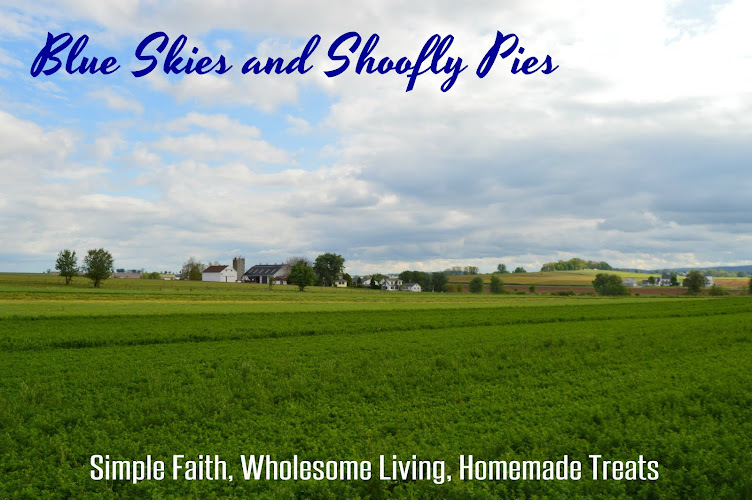 Do you have Amish roots? Yes, Lapp/Stoltzfus on my father's side. 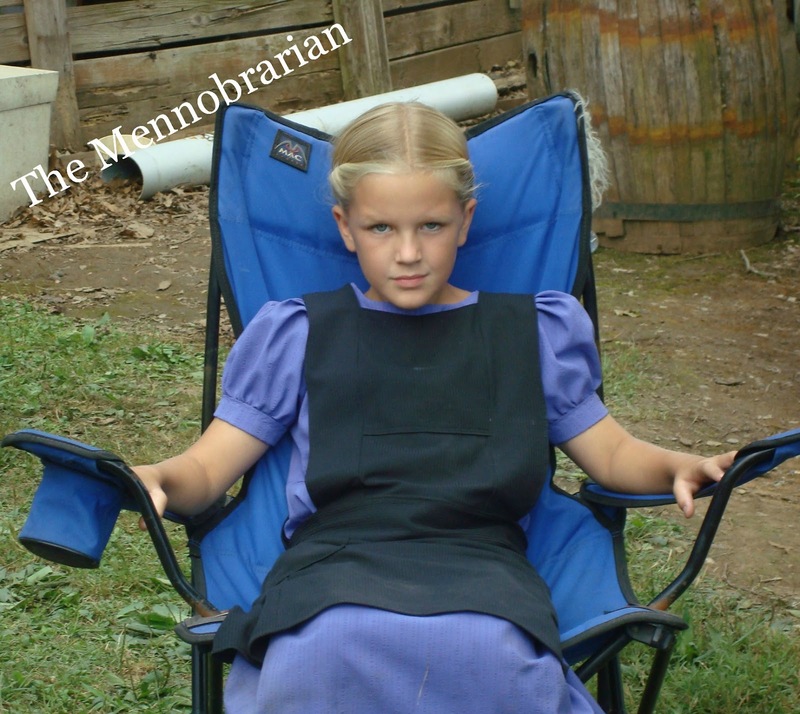 Hey we are friends with some laps here in my neck of the woods... they are of Mennonite though... Anyhoot beautiful pictures! All creatures great and small LoRd God made them all :) I love the tid bit on the older gent and the dog having a moment together.. Those are precious memories..
Beautiful pictures and story....beautiful child! I dream of one day visiting Lancaster Co. Thanks for sharing your post...it blessed me. This was actually a post within a post, you clever little bird. I've read of taking babies and dogs to retirement and nursing homes (not at the same time - hello, overload) and it really makes the residents brighten up. When my mom had to go to rehab (not drug, but physical) for a few weeks, the place had a couple Shih-tzus that just lived there and pranced around and laid in the middle of the floor. It was adorable and such a "homey" touch. It wasn't planned to be a post within a post, but I was thinking about that old man and Buddy a lot recently. Then, when I went to write about the reunion, I couldn't stop thinking of Lydia and the dog. This is because seeing children interact with dogs always reminds me of that old man and Buddy. It happens when I take Buddy to the park and you can see these children who love dogs run over and ask to pet him, and then lose themselves in the experience. There is something healing there. God uses dogs to heal. Beautiful pictures, Monica! We moved to Lancaster County around two months ago from Long Island, NY. We never grow tired of Lancaster's beauty......I feel like I am on a constant vacation......the slower pace in living everyday life is so refreshing and a welcome change from the extreme busyness of NY. I had to chuckle about your Mister forgetting to request a day off from work because my husband has a tendancy to do that, too! :) On a different note, I have a question/favor to ask of you. Could you send me an email at randster11793@yahoo.com so I could have your email address? When I click on your email link, my computer sends me a warning, which makes me a little nervous. Randi, I sent you an e-mail. I double checked my e-mail address here and it's safe. It's themennobrarian at gmail.